The Plague is presented by Praxis Stage. Based on the novel by Albert Camus. Adapted by Neil Bartlett. Directed by Daniel Boudreau. Assistant Director: Mary Thames. Dramaturgs: Michael Anderson and Robin Abrahams. Lighting Design: Read Davidson. Sound Design: Jay Mobley. Props: Jeff Manzelli. Violence Choreography: Nathan Johnson. Costumes: Sarah Josselyn. I’ve never read any Albert Camus. I don’t say that with any sort of pride or despair; it just is what it is. The year-long philosophy class I took in high school focused mainly on ethics. My first semester in college I took a Philosophy in Literature course but it focused more on Jean Paul Sartre, with whom Camus is often linked via the school of Existentialist thought. In the time since, I’ve read (or at least skimmed) several of Sartre’s plays and philosophical texts, but never got around to checking out the novels of his counterpart. The two writers didn’t always see eye to eye, but Camus was just as committed to exploring what he saw as the human condition through a number of novels, plays and essays. 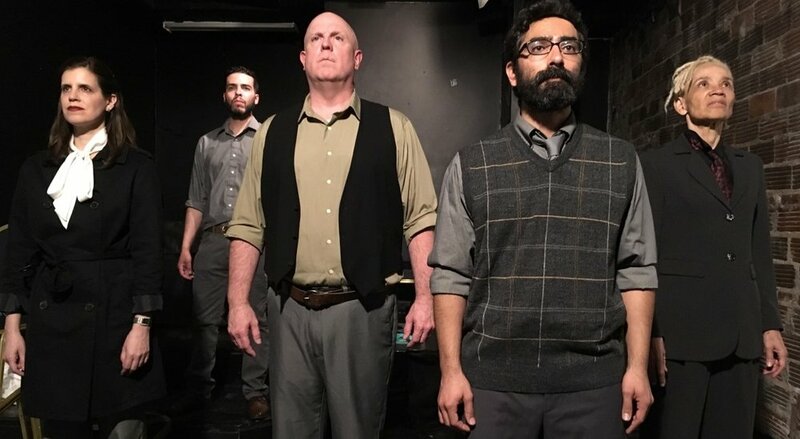 The Boston-based theater company Praxis Stage is currently presenting a theatrical adaptation of what is perhaps Camus’ best-known novel, The Plague in a riveting production. Being previously unfamiliar with the work, I’m afraid that I cannot speak as to how faithful of an adaptation the play is, but what I can say is that that this tightly run production easily makes the case Camus’ vision of human behavior cuts as deep as it ever did. The title tells you all that you need to know. During one spring in a nameless city (the location is purposefully kept vague), the citizens notice that the rats are dying from some unknown disease. Only a few at first, but then the numbers begin to pile up. Soon, humans begin to contract the disease where, after a period of illness, they meet the same bloody end that the rodents do. Then it spreads. It isn’t long before the entire city is overrun with plague (again, the exact disease is kept somewhat vague, but we’re talking plague of the bubonic/black death variety). The government attempts to step in in order to prevent mass panic and to contain the situation but to no avail. It continues to spread. The bodies begin to pile up. To prevent further contamination the city is quarantined, leaving the inhabitants to go about their daily lives with the threat of disease and imminent death hanging over their heads. Since this is an adaptation of the original novel, it’s not only Camus’ writerly efforts at work here. The novel (a Wikipedia synopsis tells me) presents the story of the city via the perspective of an unnamed narrator. For the stage adaptation, playwright Neil Bartlett chooses to stage the action almost as a living documentary, (I think) much to the narrative’s benefit. The action of the play quick cuts from one scene to another, following the fortunes of a handful of citizens living within the city. Periodically these characters will speak directly to the audience, providing exposition and context for what’s happening between characters. The choice helps enforce the idea that what we’re watching isn’t any one person’s story, rather it’s a story about society as a whole and how we collectively respond to catastrophe. I saw Praxis’ production of The Plague at Dorchester Art Project (for the show’s final week, it’ll be moving to Boston Playwrights’ Theater). It would probably be generous to say that the space was cramped, but director Daniel Boudreau uses the constraint to his advantage. His staging leans in to the talking heads documentary style of the play, having the actors directly address the audience and bringing a necessary sense of intimacy to the evening. There’s not avoiding or turning away from the horror in front of you. Stage movement is kept to an absolute minimum but the play never feels stagnant. I actually found that there were a number of really subtle and effective moments within what was happening on stage. During one particular moment while one character is describing the city’s response to the plague, another character is sitting at a desk, rubber stamping some documents. As I sat there, watching this juxtaposition, a sense of dread began growing in me. Something about the mechanical nature of both actions made me uneasy. It’s this sense of dread that the production feeds off of. The longer the society in The Plague has to live with the disease, the harder it tries to wrench itself free until we’re eventually given a prophetic vision of Holocaust-level proportions. Thankfully we have a fantastic ensemble leading us down the path to hell. The company of actors gathered here dig into their individual characters but never lose sight of the whole. I really felt that the group was working together as a team to tell the story. The characters in the play are fighting for their lives and the company of actors manage to show that grim determination to both survive and not lose their humanity in the process. It’s a fantastic balancing act to watch. I’ve read audience responses to the production saying that it has particular relevance in the age of Trump. I’m actually going to go ahead and disagree with that statement. Not that it doesn’t have relevance to the world of today. It does, but I think that’s because the story has relevance to every age. The circumstances of The Plague could apply to any number of catastrophes from human history. The AIDS crisis, Hurricane Katrina, the Holocaust, any large scale war effort. The fact that the play keeps the location and the exact nature of the disease nebulous isn’t by accident. If the play were too specific about its details, then it would be easy for the audience to write it off as something that happened long ago. What the play is really after is a dissection of human nature. What do our responses to catastrophe say about humanity? As we leave the theater and go about our daily lives, we’re left with the uneasy realization that those people up on stage living under the plague are just like us. They’re just like us. The Plague is presented by Praxis Stage May 11-20, at Dorchester Art Project and May 23-27, 2018 at Boston Playwrights’ Theatre.